Looks like my last post was the best image of the session on 19th September 2012. The seeing conditions improved as the session went on, and Jupiter rose by about 4 degrees during the session too. Anyhow, the earlier images show the progress of the GRS across the disk nicely. A wonderful morning! Went out at 4am BST to be greeted by an incredible dark and starry sky. Jupiter and Venus both blazing in the East. Jupiter gets to just over 60 degrees in altitude from here in the UK this apparition, making for decent imaging if the seeing is good. Well the seeing was good this morning! This shot was the last of several runs, and has the Great Red Spot (GRS) just past the meridian. As always click on the image to see it full-size. It was so nice – cuppa in hand and Jupiter rock steady on the screen. A glorious sight through the eyepiece too! 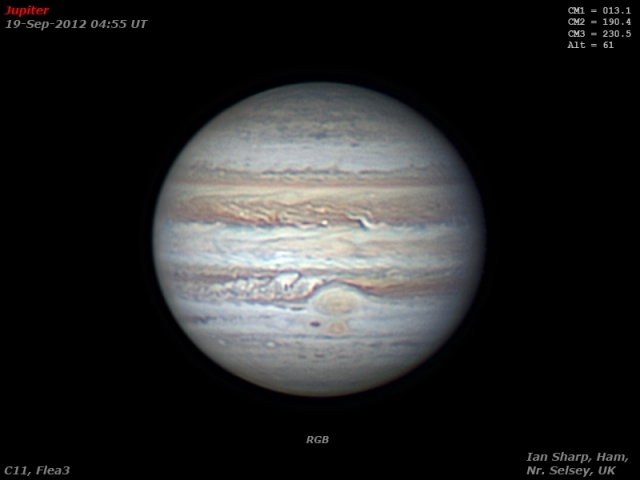 Note ‘Red Spot Junior’ just to the South of the GRS. Lots going on too in both the NEB and the SEB. This image was constructed out of 9, 60 second captures at about 64 frames per second. 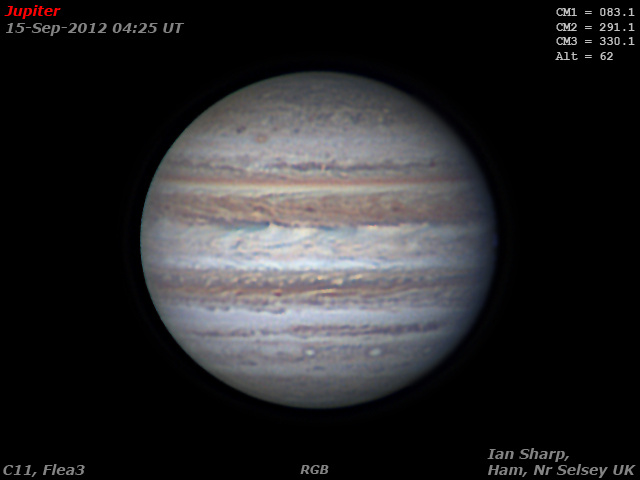 The sequence of colour filters was RRGGGGGBB.These were ‘de-rotated’ and combined into an RGB using WinJUPOS. This process prevents the features smearing out due to the rotation of Jupiter. 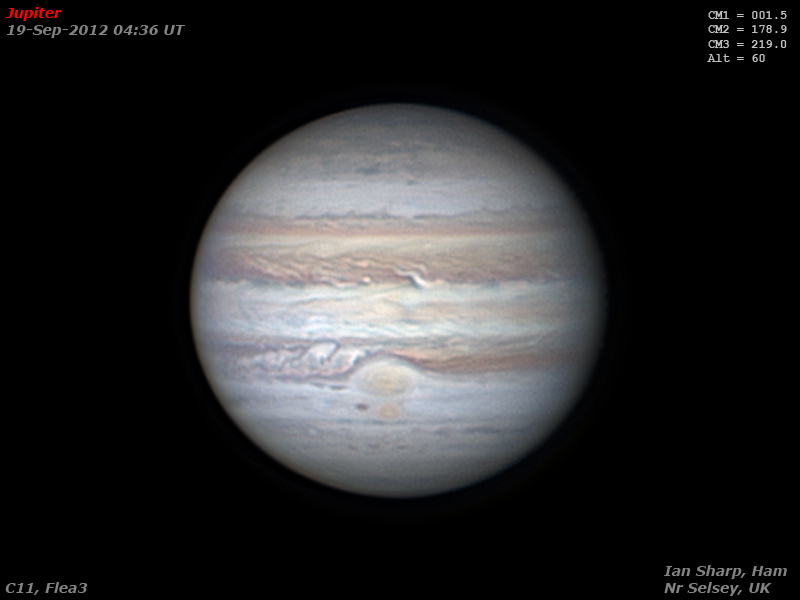 Here is my first attempt at a Jupiter image from his morning. As it turned out, it was a bit of a luxury as the seeing conditions and transparency were excellent. One reason for my long period of astronomical quietness was that I was waiting for the RA motor and encoder on my ancient AP900 mount to be repaired by AstroPhysics in the US. Wonderful service as usual from AP, but it got held up in UK Customs for ages!